In the 1920s and 1930s, anybody who was anybody tried to figure out how to rid the world of war. Collectively, I’d say they got three-quarters of the way to an answer. But from 1945 to 2014, they’ve been ignored when possible (which is most of the time), laughed at when necessary, and on the very rare occasions that require it: attacked. What a flock of idiots the leading thinkers of a generation all must have been. World War II happened. Therefore, war is eternal. Everyone knows that. But slavery abolitionists pushed on despite slavery happening another year, and another year. Women sought the right to vote in the next election cycle following each one they were barred from. Undoubtedly war is trickier to get rid off, because governments claim that all the other governments (and any other war makers) must go first or do it simultaneously. The possibility of someone else launching a war, combined with the false notion that war is the best way to defend against war, creates a seemingly permanent maze from which the world cannot emerge. But difficult is far too easily distorted intoimpossible. 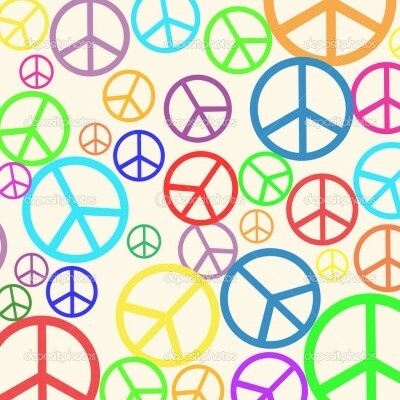 War will have to be abolished through a careful and gradual practice; it will require cleaning up the corruption of government by war profiteers; it will result in a very different world in just about every way: economically, culturally, morally. But war will not be abolished at all if the meditations of the abolitionists are buried and not read. 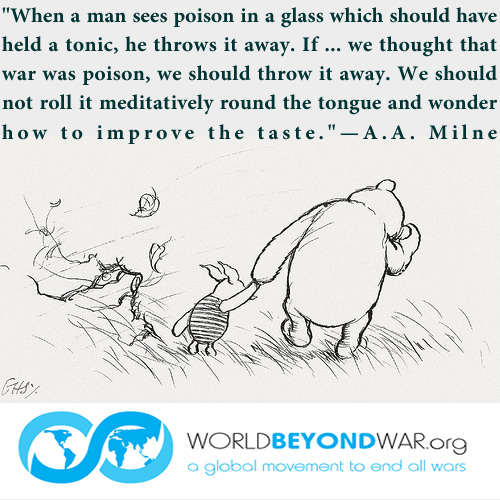 Imagine if children, when they’d just gotten a bit too old for Winnie the Pooh and we’re becoming old enough to read serious arguments, were told that A.A. Milne also wrote a book in 1933-1934 called Peace With Honour. Who wouldn’t want to know what the creator of Winnie the Pooh thought of war and peace? And who wouldn’t be thrilled to discover his wit and humor applied in all seriousness to the case for ending the most horrific enterprise to remain perfectly acceptable in polite society? Now, Milne had served as a war propagandist and soldier in World War I, his 1934 view of Germany as not really wanting war looks (at least at first glance) ludicrous in retrospect, and Milne himself abandoned his opposition to war in order to cheer for World War II. So we can reject his wisdom as hypocrisy, naiveté, and as having been rejected by the author. But we’d be depriving ourselves of insight because the author was imperfect, and we’d be prioritizing the ravings of a drunk over statements made during a period of sobriety. Even the ideal diagnostician of war fever can sound like a different man once he’s contracted the disease himself. Milne debates popular arguments for war and comes back again and again to ridiculing it as a foolish cultural choice dressed up as necessary or inevitable. Why, he asks, do Christian churches sanction mass murder by bombing of men, women, and children? Would they sanction mass conversion to Islam if it were required to protect their country? No. Would they sanction widespread adultery if population growth were the only path to defense of their country? No. So why do they sanction mass murder? Milne tries a thought experiment to demonstrate that wars are optional and chosen by individuals who could choose otherwise. Let us suppose, he says, that an outbreak of war would mean the certain and immediate death of Mussolini, Hitler, Goering, Goebbels, Ramsay MacDonald, Stanley Baldwin, Sir John Simon, one unnamed cabinet minister chosen by lot on the day war is declared, the ministers responsible for the military, Winston Churchill, two unnamed Generals, two unnamed Admirals, two unnamed directors of armaments firms chosen by lot, Lords Beaverbrook and Rothermere, the editors of The Times and The Morning Post, and corresponding representatives of France. Would there, in this situation, ever be a war? Milne says definitely not. And therefore was is not “natural” or “inevitable” at all.